Muhlenberg County Kentucky’s pro-business climate provides many incentives for businesses. The Kentucky Economic Development Finance Authority (KEDFA), established within the Cabinet for Economic Development to encourage economic development, business expansion, and job creation, provides financial support through an array of financial assistance and tax credit programs. Helping businesses in this way furthers Muhlenberg County’s, and the Commonwealth’s, goals of achieving long-term economic growth and employment opportunities for its citizens. Since every company’s project needs are different, all incentives offered in Kentucky and Muhlenberg County are tailored to those specific needs. Following are some of the incentives which may be applicable to your project. As always, MAP serves as your first point of contact. We will work diligently to put together the right package for your new or expanding business. 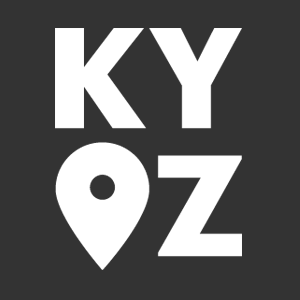 The 620 acre Paradise Regional Business Park located in Graham, Kentucky benefits from being in an opportunity zone location. Opportunity zones were created by Congress to encourage long-term investments in low income urban and rural communities nationwide. In Kentucky, 144 industrial sites in 84 counties have been designated as Opportunity Zones; Muhlenberg being one of them. What are the advantages of investing in an Opportunity Zone? 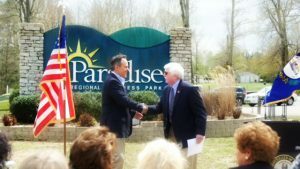 Governor Matt Bevin naming the Paradise Regional Business Park an Opportunity Zone. Click here to view examples of how the Opportunity Zone incentive works. The following tourism-related incentives are administered through the Kentucky Tourism, Arts and Heritage Cabinet.